Tim Brayton: "It is a film entirely about the human cost of violence, and this is true even of the most enthusiastic displays of violence: there's nothing cartoony or absurd in any of it, just the very detailed and horribly imaginative depiction of what would happen to a real human body when this kind of punishment is doled out. It doesn't even need to be hyper-gory violence: one of the film's most deeply affecting scenes finds a quintet of students, having formed a cohesive bond of mutual protection, turn on each other almost entirely by accident, until there's not a one of them left. That's where Battle Royale is at its strongest: when it can make us feel, through all of the splashes of stage blood, the simple act of being human, with the attendant desire to be alive and unharmed as much as possible. The scene of scared girls overreacting and massacring themselves in pure fear, the sad suicide pact near the beginning of the battle, the look of disappointed shock on so many faces in the moment they realise they're dead; in different ways, these all get to the heart of the film, which is its righteous anger at seeing adolescent life cut short or even just needlessly constrained and corralled by rules and the pettiness of adults. It's a very special film, one whose genre trappings, though essential, obscure how universal it truly is." Joshua Rothman (New Yorker): "Say what you will about the new film version of “The Hunger Games”—one thing it’s not is rebellious. A key to the film’s success is that it only flirts with real violence, pain, and outrage—in the end, it’s a family film, which offers parents a chance to bond with their kids over the bewildering nastiness that is adolescence. If it’s rebellion you want, you’re better off seeing the Japanese film “Battle Royale,” which anticipated “The Hunger Games” and, in many ways, bettered it. “Battle Royale” is also about a group of teen-agers murdering each other in a gladiatorial contest. But its extreme violence and candor—it was nearly banned by the Japanese Diet—lets it say the things “The Hunger Games” can’t quite bring itself to say." Richard Scheib (Moria): "Fukasaku is primarily a pulp director. For all the censorship battle that it provoked in some countries when it came out, Battle Royale is intended as no more than a comic book. Fukasaku is not is interested in sociological messages and expends a minimum of explanation on setting up the background of the future before getting to the main action. He has a good deal of fun with the violence with some amusing images of schoolgirls wiping each other out with Uzi’s or slitting each other’s necks with scythes. The film comes littered with these ultra-violent pop-up images – they are the film’s raison d’etre." Video essay: Was this Japanese film an inspiration for Hunger Games? Well, I needed an excuse to rewatch it, so I'll take it. I wish this movie weren't compared to The Hunger Games so often. (I think people cite it as a way to sound superior.) They're doing two very different things, both well. 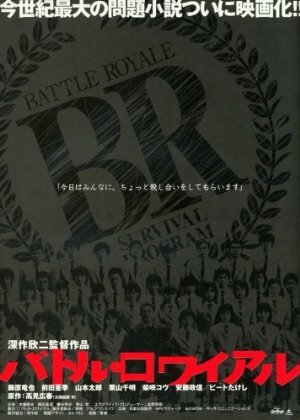 Battle Royale is about high school and adolescence, using war as a metaphor. Hunger Games is about war and the psychological damage done to soldiers, using a brutal teenage game show as a metaphor. I looked away from all the bloody bits and still was quite affected by it as a teenager myself, even to the point of going out and buying a translation of the original novel to read, lurking fan communities, etc. I'm not sure what to make of the quoted critic's view of "school girls slitting each other's necks" as "amusing". Now that's one fella you wouldn't want to get stuck in BRverse with. Isn't a matter of relativity, though, when you're talking about a film dedicated to depicting mass slaughter in often mundane and realistic manners, which, apparently, a good number of people find entertaining? I mean, if slaughter is entertaining, isn't it possible that any particular scene might evoke amusement? The thing I remember must about this movie was Takeshi's amazing non-acting in his death scene. He just kind of walks a bit then falls down. Only he could sell that as a performance I think.